Washington, DC Over the weekend Bush aids confirmed earlier preliminary reports that UN Military inspectors had located Saddam�s cache of .WMV�s. The initial find was uncovered several weeks ago deep in one of Hussein�s bunker hideouts. �This confirms the veracity of earlier intelligence reports that Saddam was stockpiling his own personal cache of .WMV�s,� said a White House Spokesperson. But, while the Bush camp is trying to spin the discovery to curry political favor of those skeptical of the decision to invade Iraq, critics say he is misleading the American Public. �Bush thinks he can pull a fast one on the American people who might confuse the .WMV�s for WMD�s. He is banking on the fact that many American don�t realize that .WMV, which stands for Windows Media Video, is simply a file extension type designating certain types of digital video formats, not Weapons of Mass Destruction,� said a Democratic Party Official. Putting the political implications aside, this discovery still ranks as a fascinating glimpse into the world of a madman. �Many people are curious to know �how does a ruthless dictator spend his leisure time?�,� said Dr. John H. Crabtree, a Sociologist at Bronx Community College. Well, if the .WMV files recovered from his computer are any indication, the notoriously insane despot Hussein was highly interested in things inane. 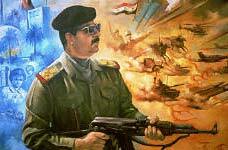 Some video files recovered from his hard drive included video clips widely circulated via the Internet, which might indicate that Saddam spent significant amounts of time on-line. One video depicts the popular sport blooper where a pole-vaulter clears the bar only to be hit in the groin by his own pole. Another clip recovered from Saddam�s computer shows the footage of the time that a seagull flew right into a pitch at an MLB game, the result being a plume of white feathers. Also collected from Saddam�s computer was an extensive MP3 collection, presumably obtained through illegal downloading, which according to UN inspectors featured a comprehensive Whitney Houston collection.